Jacobello del Fiore (c. 1370 – 1439) was an Italian painter of the 15th century active mainly in Venice. His work marks the transition from the local, conservative style based on the example of Paolo Veneziano and his followers to a decorative fully developed Late Gothic style. He was the son and pupil of the painter Francesco del Fiore. One of his pupils was Carlo Crivelli. While starting his career in a conservative style reminiscent of Paolo Veneziano, his output developed towards a more developed, Late Gothic style after 1410. It is he believed that at this time he was probably engaged in the decoration of the Sala del Maggior Consiglio (Hall of the Great Council) in the Doge's Palace in Venice alongside artists such as Pisanello, Gentile da Fabriano and possibly Michelino da Besozzo. The courtly influence of these artists is visible in his later paintings. Among Jacobello's most important paintings are the Madonna of Mercy (c. 1415) and the Triptych of Justice for the Magistrato del Proprio in the Doge's Palace (both now in the Gallerie dell'Accademia, Venice). His series of panels depicting scenes from the Life of Saint Lucy (Civic Museum, Fermo) is regarded as his masterpiece. 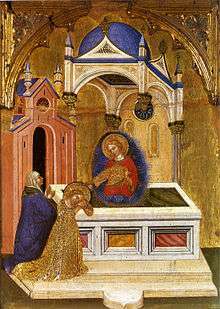 Among Jacobello's works are further a Coronation of the Virgin for Cathedral in Ceneda and the polyptych in the Teramo Cathedral. ↑ Farquhar, Maria (1855). Ralph Nicholson Wornum, ed. Biographical catalogue of the principal Italian painters. Woodfall & Kinder, Angel Court, Skinner Street, London; Digitized by Googlebooks from Oxford University copy on Jun 27, 2006. p. 65.